Japanese warplanes made a deadly assault on Honolulu and Pearl harbor Sunday in the foremost of a series of surprise attacks against American possessions throughout the Pacific. Three hours later the Japanese Government declared war on the United States and Great Britain. Soon a second wave of Japanese bombers roared over shocked Honolulu. The Tokyo radio said Japanese forces also had attacked the British colonies of Hon Kong and the Malay States. Capture of the U.S. Gunboat Wake at Shanghai and destruction of the British Gunboat Peterel nearby. There was little news of U.S. defensive actions, except the report that a number of the attacking planes at Honolulu had been shot down in dog-fights over the city; an unconfirmed report that a Japanese aircraft carrier had been sunk off Hawaii; and announcement that U.S. Army and Navy forces had started carrying out secret instructions long since issued to them in event of just such and emergency. The broadcast was picked up by the NBC listening post. Tojo appealed to all Japanese to cooperate in the struggle and declared that in 2,600 years of history Japan never had lost a war. Why did Japan declare war against us today? We “attempted to frustrate Japan’s aspiration to the ideal of common prosperity” in Asia. “The American Government, obsessed with its own views and opinions, may be said to be scheming for the extension of the war. “While it seeks, on the one hand, to secure its rear by stabilizing the Pacific area, it is engaged, on the other hand, in aiding Great Britain and preparing to attack, in the name of self-defense, German and Italy. Japan’s attack on American outposts today brought immediate expressions of indignation from members of Congress, and most freely predicted that Congress would adopt a declaration of war without hesitation if President Roosevelt asked for oen. Such vigorous critics and opponents of the Administration’s foreign policy as Senator Wheeler (D-MT) and Rep. Fish (R-NY) called for unity. “The only thing now is to do our best to lick hell out of them,” Wheeler said at Billings, MT. Russian collaboration with the United States in fighting Japan, he said, was a possible means of entry by this country into the European conflict. There were calls, too, for the nation to keep calm. 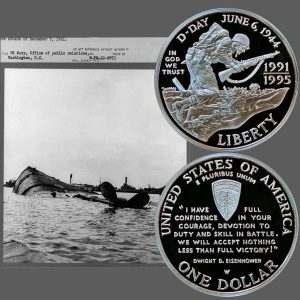 The World War II Commemorative Silver Dollar Coin shows with an image of the USS Oklahoma lying capsized at Pearl Harbor, December 7, 1941.